I started by digging into the recycle bin, grabbing the front page, and flipping through to one of those headlines. 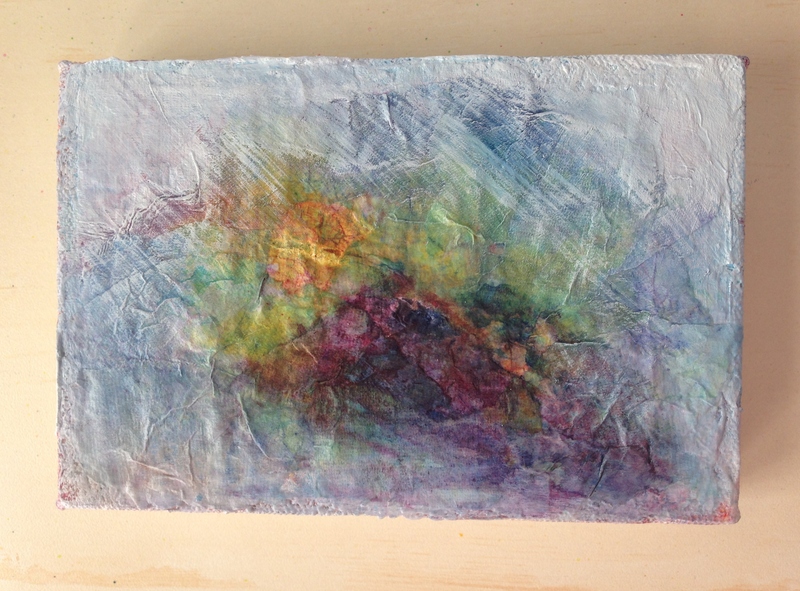 Ripped it out of the paper and tore it in strips, and collaged it to my canvas with Golden soft gel medium. It doesn’t take long to dry in the summertime with no retarder added, so I didn’t have to wait long before throwing paint at it, to cover it up. “Make pretty, make pretty” I said to myself…..and it just wouldn’t be made pretty! So I covered it with Golden Titanium White fluid paint. Very opaque, totally covered in no time. But I needed more texture. So I grabbed a sheet of white rice paper, crumpled it up, spread it out, and grabbed the Derwent Inktense blocks and started rubbing blue, red, magenta lengthwise on the paper. Hit it with a damp brush and took another look. Gave it a few seconds to dry a bit, shredded that one too…..coated my surface with more Golden soft gel, and started laying the strips in. Still wasn’t thrilled with it, so I dripped some Yellow Dr. Ph. Martin’s Bombay India ink in, and hit it with a spray bottle of water so it would travel. Let that dry….and picked it up again. And boy, was this therapeutic. I encourage you, if those headlines bug the heck outta you like they do me…….tear them up and turn them into something happy. You might be surprised at how the day (and your mood) turns around afterward. Happy Almost Weekend to all! I hope you paint like you mean it this weekend! Peace. Very abstract use of colour Laura, maybe this is what Donald Trump sees when he looks in the mirror before shaving? Such a BEAUTIFUL way to create beauty from the commotion going on in the news. I love it, and I love your thoughts “Make Pretty” and your perseverance until it got there. Love it! I just wish I could make the actual person go away; oh well, hopefully he’ll take care of that himself. Thank you Carrie. It was even the American flag at one point. It went through some stages. But I needed a mountain escape and didn’t even know it! I was sure glad with the way it turned out. Really glad you like it!!! With all the crazy of this world, we all wish that we can just splash on white paint and start over. We can only hope for the better. As always, so fun to hear of your art adventures. Thanks Wendy. I’m finding the need to manage the national embarrassment of someone I won’t name……much appreciated. Thank you. Me too, re phthalo blue. Now if I could just make him vanish, Ann! He’s embarrassing our whole country. Thanks, glad you enjoyed it. Ugh… what’s up with the spam. Debi was in Spam too and Jodi said you were spam yesterday along with me! lol I think something is really off, I’m sending WP a note. I like the final effect a lot. Thank you. I actually like this one too, even though it didn’t get lots of buzz. I want to do lots more of these with collage. Glad you enjoyed it! Very therapeutic and I love how it turned out! Very Turner-esque. I love this one. You are smart. I need to do the same. I’m really glad you like this one, Kerfe. It’s one of my favorites. I love the accidental quality, and I think this is the one that told me I need to do more collage work. Great way to get texture into a painting. Sometimes we hear the news even when trying not to, so this is a great way to deal with it. I love what you did. It is fun to hear about the iterations it went through!